I'm always trying out new and interesting soup ideas. Because it's winter, my need to create yummy, comfort foods is heightened and soup is usually on the top of that comfort food list. We're big fans of stick-to-your-ribs kinds of soups and chowders in the winter because they make such a great meal and they taste so good and they make you feel so warm and fuzzy inside and...well, you get the idea. Potato soup is one of our favorites but I decided to take a different approach with this version to create more of a chowder instead of soup. Wondering what the difference between a chowder an a soup is? Well, a chowder is something that's kind of between a soup and a stew. In it's simplest definition, a chowder is thicker and chunkier than a standard soup. 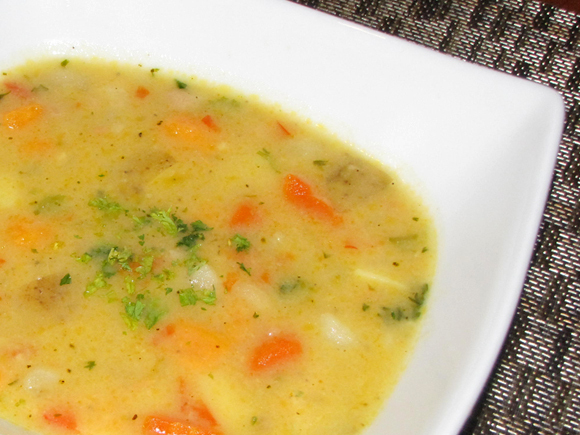 Chowders are heartier and great for a winter-time dinner. 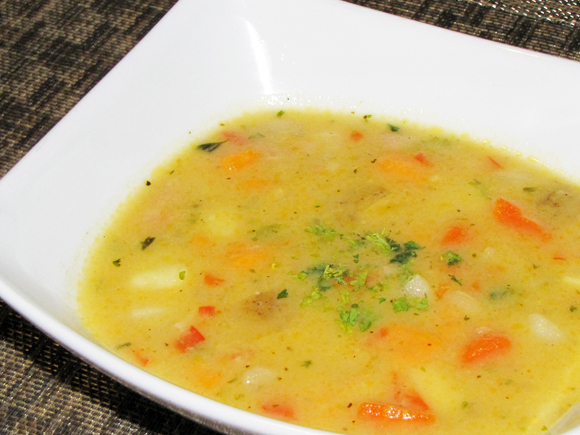 This potato chowder is different than your usual potato soup because it's full of veggies and three different kinds of potatoes for interest and taste. There are standard white potatoes while the addition of golden and sweet potatoes lends a natural sweetness. It's full of flavor without the added calories and fat of bacon or cheese which also cuts down on the heaviness. I added beans for another healthy boost of flavor and a bit of sage for that extra hint of depth. The end result became a yummy chowder that everyone will love and is great with a crusty piece of bread! 1. In large pot, heat butter and oil over med-low heat. Add onion, celery, carrot and red pepper. Cook until softened, stirring occasionally. 2. While vegetables cook, dice potatoes (peeled or unpeeled) into 1/2" pieces. 3. When vegetables are soft, add potatoes and garlic and stir well to coat. Cook for about one minute then add chicken stock. Bring stock to boil over high heat then lower to simmer. Cook for about 15-20 minutes or until potatoes are soft. 4. Whisk together milk and cornstarch together and add milk mixture to pot. Stir well then increase heat to bring to a boil. Reduce heat to low. Add beans, salt, pepper, parsley, and sage. Cook for about 7-10 more minutes or until beans are heated through.